What are Foodgrade Bulk Bags? Foodgrade Bulk Bags are made for use in storing and transporting of food materials. These bags can be made in any common bulk bag shape and size. The materials used for making and lining these bags needs to be FDA-approved and durable at the same time to offer ideal storage and shipping of various types of food materials. What are the advantages of Foodgrade Bulk Bags? 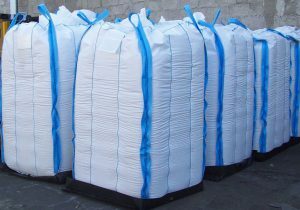 The materials used in manufacturing Foodgrade Bulk Bags provide zero-contamination and leak risk to the goods stored within. The versatility of the materials that can be used to make Foodgrade Bulk Bags allows it to store and transport various types of perishable and non-perishable food stuffs. What are Foodgrade Bulk Bags useful for? Foodgrade Bulk Bags, as the name suggests, is useful for storing and shipping various types of food materials. The bags can be made into different shapes and sizes according to the foodstuff which requires it. This allows better storage and improved capacity of liquid and solid food materials. Why choose Simplex Chemopack Foodgrade Bulk Bags? Simplex Chemopack has swiftly become a leading provider of industrial packing and storage solutions. The company offers a wide range of bulk bags designed to suit various customer requirements. The Foodgrade Bulk Bags from Simplex are designed and developed using only the highest grade FDA-approved material to ensure that all customers can easily store and ship different types of food materials more efficiently.